Cathy has contributed so much to the Davis schools that honoring her for her contributions is appropriate and well-deserved. She graduated from Davis High School in 1978. As a Blue Devil, Cathy was editor of the yearbook, the Blue and White, during her senior year. After graduation she attended UCLA and then King Hall School of Law at UC Davis. She had a very successful career as a skilled litigator in Southern California prior to returning to Davis to raise her children. The Davis Schools have been fortunate to have Cathy back in town since the late 90s. Cathy served as PTA President at North Davis Elementary during the 2002-03 and 2003-04school years. She then served as the Holmes Junior High School PTA President in 2008-09 and 2009-10. 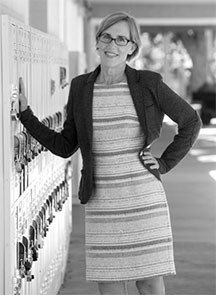 In 2011-12 and 2012-13, Cathy was the PTA President at Davis Senior High School. When Harper Junior High was built, Cathy served on the District’s boundary committee, helping guide the district on where to redraw school boundary lines. She was also instrumental in the creation of a supportive organization called the Parent Leaders Group (PLG), a group where all PTA presidents are invited to join to share the joys and challenges of being a PTA leader in Davis. In 2013, her youngest child graduated from Davis Senior High, and all parent leaders were sad to see her time as a parent of children in the school district come to a close. However, she has continued to volunteer her time in the classroom at Willett Elementary through the time she was selected for the award. Probably the most lasting contribution Cathy has made to the community was her vision regarding the inception of the Davis Schools Foundation. In 2004, Cathy saw the need for more financial support for all schools in the District, not just the schools her children attended, and she started the Davis Schools Foundation with a small group of dedicated community volunteers. Cathy served as the DSF founding president and introduced the community at large to the idea of a foundation that would support all students in the district. Because of Cathy’s foresight, the foundation was available for concerned community members when the state funding crisis hit the Davis schools in 2008. Other districts had no mechanism for saving vital programs because they did not have someone like Cathy, who had set up the foundation in advance of the crisis. Today, the Davis Schools Foundation has provided millions of dollars in support of our excellent public schools, enhancing the quality of education for all students. Cathy is an extremely intelligent person, who brings all her dedication, her organizational skills, and her thoughtfulness to everything she does on behalf of students in our community. More important, Cathy is a problem solver who can see both sides of issues that come up and help find a solution that provides benefit to all.